Confusion comes naturally on No Kissa. “Vaporwave? Ambient? Screw?” riddles the description for this, the first new release from the project (they describe themselves as an “enigma unit”) of the same name in four years. But this playfulness is what makes No Kissa an absorbing listen, as No Kissa avoid falling into any specific genre trappings, allowing them to make something that echoes a bunch of familiar sounds without really sounding like it (though…it’s not screw music, that’s actually an easy call). It’s closest to what ΔKTR (who, hey, developed the cassette for this) does, which is to take dusted music and loop it into a way to really find the best part. 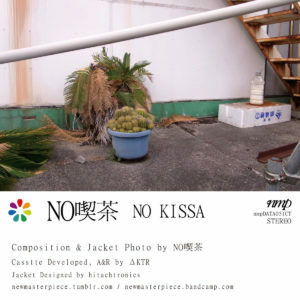 Stretches of No Kissa offer downright meditative creations coated in a bit of tape fuzz, from the opening track to the classic-tinged “Attsui Onsen.” It can be downright melancholy — just check “Tenmado Checker,” pure post-midnight lonely streets soundtrack material. Yet the bulk of No Kissa weaves in a beat and sliced-up samples, but often just haves more fun with it. “Dear Drivelight” revels in syllables that practically stutter, while later songs play around with the pitch of samples to create warped little love songs. And hey, plenty of smooth guitar playing sneaks in as well, though all of it still feels like a different perspective on the style (see the goofy synth boogie of “Handshake Boy”). This is a nice summary of No Kissa, and a lovely new take on something that felt so familiar this decade. Get it here, or listen below.